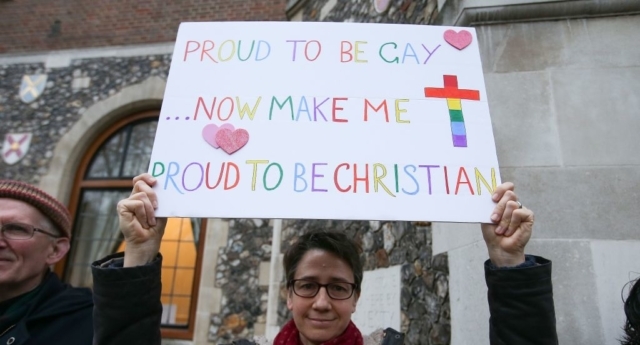 The Church of England has called for the government to officially ban “gay cure therapy”. During a private member’s motion (PMM) the General Synod overwhelmingly backed a motion for a ban on the unethical practice. The PMM said because “gay cure” therapy is seen as “harmful” by professionals, and those who largely force the practice are not professionals, it should not be permitted in the church. “Given that many practitioners are non-medically trained religious leaders, it is imperative that the Church of England is unequivocal in its condemnation of such harmful practices,” they said in a statement. Jayne Ozanne, the LGBT campaigner who presented the motion, said that “gay cure therapy” should have “no place in the modern world”. Ozanne had been subject to “gay cure therapy” herself in the past. She said to the Press Association: “I call it abuse. I believe it is spiritual abuse. “It (sexual orientation) is a very delicate area that only true professionals should be dealing with. And they won’t try to change people’s sexual orientation, they will help them try to deal with it. “What people don’t understand is that you can enter into this sort of practice willingly because you think it is the right thing to do because you have been told it is what God wants. The motion was signed by the Royal College of GPs and the UK Council for Psychotherapy and the C of E has now officially endorsed it. Related: 10 things you’ve always wanted to ask somebody who’s been through gay conversion therapy. Figureheads in the Church of England including the Archbishop of York, Dr John Sentamu, and the Bishop of Liverpool, Paul Bayes, are one of many backing the motion. Bishop Paul Bayes added that the church and the country should be paving the way for the rest of the world when it comes to condemning the practice. He said: “As the world listens to us the world needs to hear us say that LGBTI+ orientation and identity is not a crime. “LGBTI+ orientation and identity is not a sickness. And LGBTI+ orientation and identity is not a sin. Anti-LGBT organisation Christian Concern have condemned the motion for being “brought on a purely emotional basis”.